Imer gantry hoists are similar to Imer scaffold hoists in their features, the main difference is the way in which they are mounted. 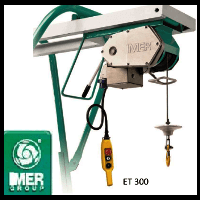 Imer hoists are well known for quality and reliability. Where a scaffold hoist mounts onto a scaffold pole, Imer gantry hoists requires the addition of a gantry frame. A gantry hoist & frame can be moved around the construction site to where they may be needed and can be utilised in areas where there is no suitable scaffolding. This means they can be used during any stage of construction of a building, for example, before scaffolding is erected, or after it has been removed towards the builds completion. Perfect for lifting tools and building materials to a higher level. Imer hoists are perfect for use on building projects. An Imer gantry hoist can be securely mounted to the tip of the frame. The framework can then be positioned over the edge of the structure to allow the hoist to do its lifting work. The gantry must be counter-balanced to the rear to prevent the gantry, hoist and load from tipping over the edge. Counter-balancing is done with the addition of ballast boxes which are fitted to the rear of the gantry frame, the ballast boxes are filled with suitable, heavy materials to a specific weight to offset the weight it will need to lift and hold. you can see more about the gantry frame in our scaffold and gantry hoist accessories page.